Pippi Longstocking is the ultimate bad girl; funny, brave, sharp, weird, outrageous. But does she really deserve a bad girl warning? I’m not sure. A better way of seeing her is as an anti-authority figure. There’s a brilliant logic and a skewed morality running through everything she does. Whether she’s giving the police the run around, causing havoc at the circus or skipping school, it’s always hard to argue with her reasoning. Despite being the strongest girl in the world she rarely has to resort to picking people up. Her great power is in bamboozling grown-ups with her remarkable lateral thinking. 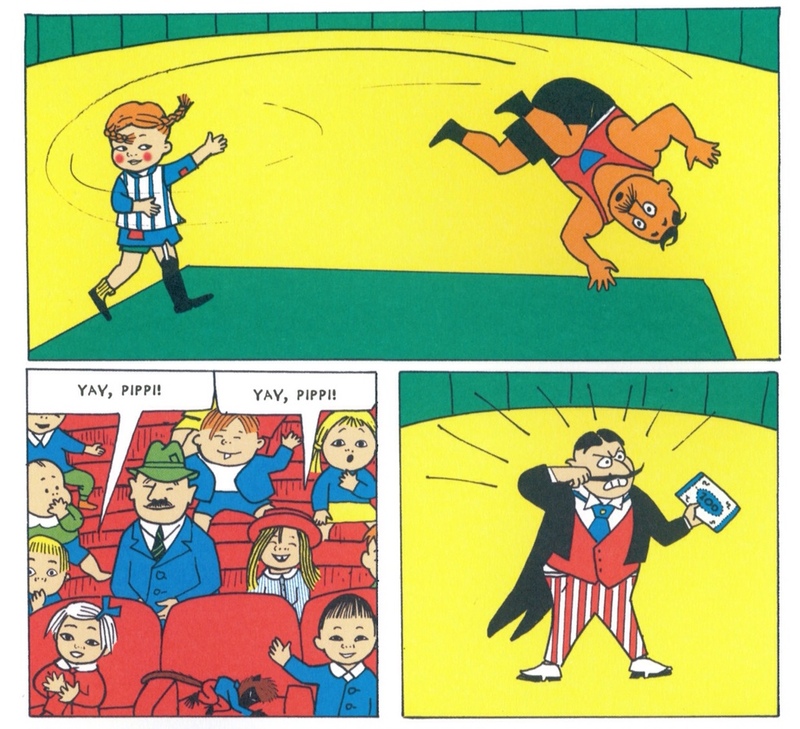 In Pippi Organises a Quiz we see her outfoxing a bullying old woman set on humiliating the town’s more ignorant children. Pippi is a product of her times, author Astrid Lindgren’s reaction to the conformity in Swedish society as it went through years of huge social upheaval. Pippi acted as a kind of release valve to the perfect society that was being created around her. In his fascinating article, Sean ‘Nicci’ French describes how Sweden’s rapid social change created ‘a culture of conformity, moderation, constraint and contentment’. 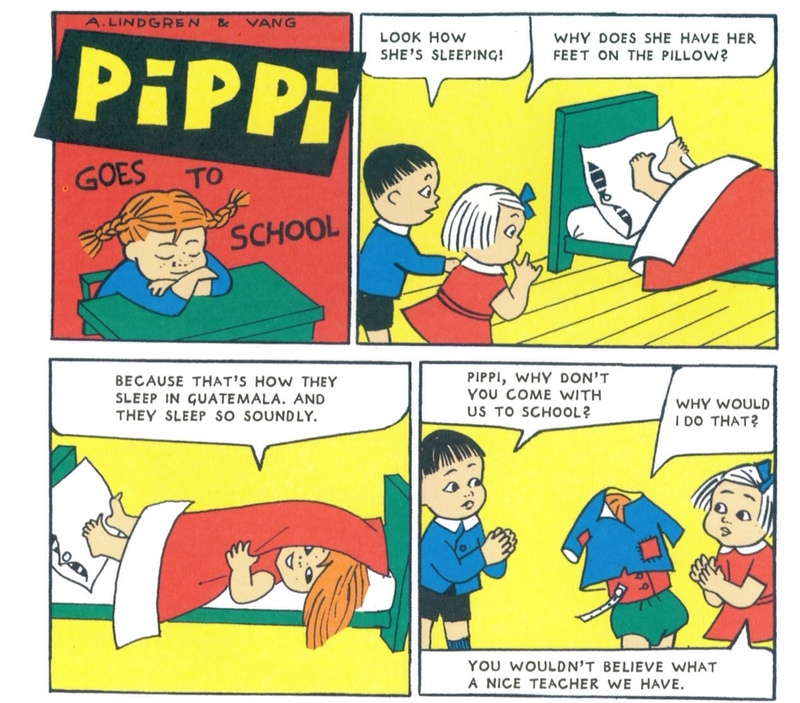 Pippi, he believes, was ‘a lament for what was lost’. Which is far more interesting than the idea that she’s some sort of junior Lisbeth Salander – a proto-riot grrrl in plaits and stripy tights. I never read Pippi as a child, and have come to it at the same time as my children. It’s rather thrilling discovering something this wild together. We’ve been reading the collected edition illustrated by Tony Ross. It was that or Lauren Child’s version. As much as I love both of their work, neither seems to get the character quite right. Child’s Pippi is a gorgeous labour of love, but possibly a little too beautiful. Ross, who did this sort of character so well in The Little Princess, goes the other way, making her too physically strange – as if she’s been through Willy Wonka’s gum stretching machine. Then a reprint of the 1958 Pippi Longstocking comics dropped through my letterbox and showed exactly why I wasn’t connecting with their work. The illustrations here are by the original artist, Ingrid Vang Nyman. With just one glance it becomes clear, Vang Nyman owns Pippi Longstocking. Her version defies reinterpretation. Vang Nyman’s Pippi might be pushing 60, but in this vivid adaptation her odd stockinged feet come leaping off the pillow. Publishers Drawn & Quarterly have done a bang up restoration job making the most of the limited colour pallette of blue, red, yellow, green and (of course) orange. The ink looks as if it’s barely had time to dry, it’s that fresh. Vang Nyman’s great achievement is to make Pippi’s fantastical feats of strength seem entirely probable from this average sized child. It’s all in her eyes; they either shrink to slits or dilate to an alarming size when she tosses a strongman, or grapples with an angry bull. The expressions on the faces of the permanently outraged adults are a treat too. Ingrid Vang Nyman was the first illustrator of the books, from 1945 to 1958. But while Astrid Lindgren became a national figure to rank alongside Ingmar Bergman and Benny from ABBA, Vang Nyman remained in relative obscurity and never achieved the recognition her work deserved. She died tragically young, committing suicide in 1959, the year after the comics were issued. My favourite story here is Pippi goes Shopping, a piece of wild, wish fulfilment that I’m sure every child has at least three times a week – a suitcase full of gold coins and the run of the shops. But before they can get to the toys and sweets there are some brilliant diversions to be had – like falling in a ditch full of water. Pippi responds to this with one of her most brilliantly surreal, freewheeling monologues. 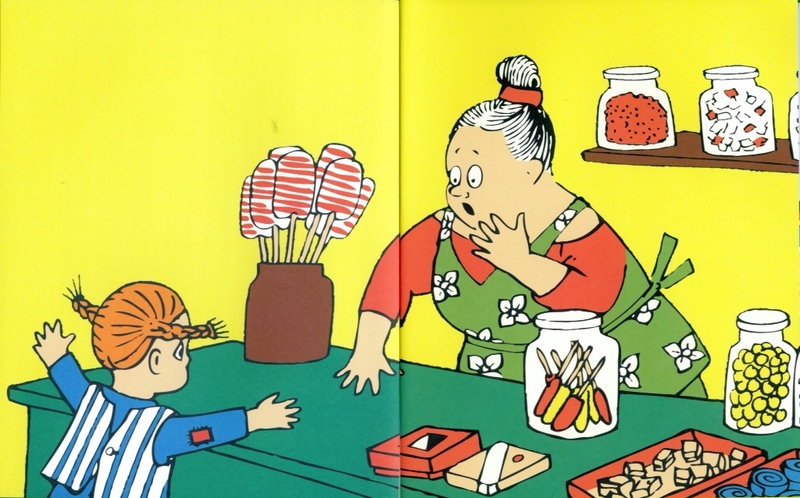 Pippi rounds off her shopping trip with a visit to an apothecary who recklessly sells her an array of treatments which she proceeds to mix together, before taking a hearty slug. ‘I think it’s a jolly good meducin. I feel terrifically well and fit for anything.’ said Pippi marching along jauntily. Maybe Pippilotta Viktualia Rullgardina Krusmynta Efraimsdotter Långstrump is a bad girl after all. 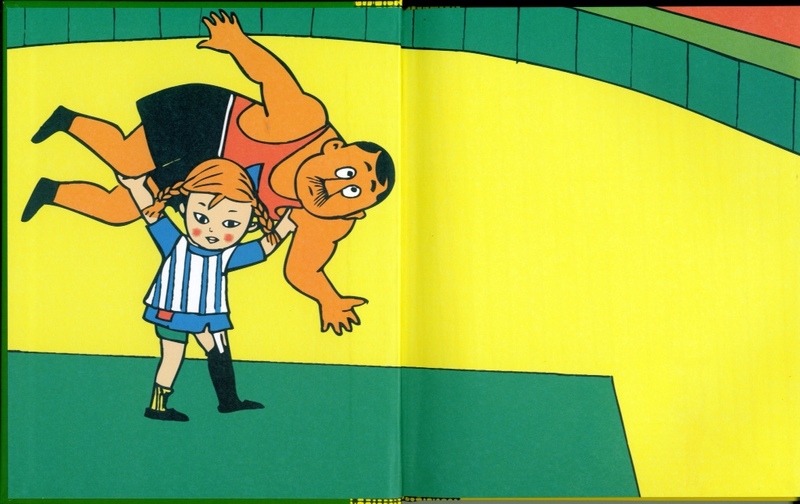 Tags: Astrid Lindgren, Ingrid Vang Nyman 100, Pippi Longstocking. Bookmark the permalink.